Knew it before I even heard it. Not a large sound, mind you. Just a definite ceasing of vertical motion of a small plastic housing upon a reasonably solid concrete floor. Only one part jettisoned. The battery housing contact plate. Ever hopeful, I placed it back where it went and closed the cover. There was as small impact gouge at one end, and that was pretty much all it took. Certainly, taking the jersey off had jettisoned the pencam in an upward arc, so it was a little more than just a clumsy drop-to-the-ground. I tried a few little digital-device CPR tricks, but it was to naught. So, that makes - what? - five I’ve munched. I’ve found myself thinking about this too much in the last 24 hours. My spirally recursive thought loop goes something like this: I bought the pencam so I wouldn’t have to worry about breaking a good digital camera. But, because the pencam doesn’t cost much, I’m more prone to putting in into a jersey pocket so I can easily get to it to snap a photo or two. 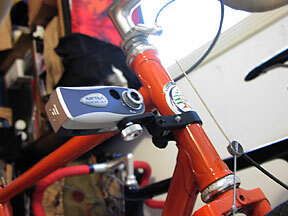 The inexpensiveness of the pencam encourages me to engage in risky behavior. If I used a higher quality piece of gear, it might lead me to use more care in its protection - putting it into my bag, for example. But then, I’d take fewer photos. Of course, if I had to pay for film and processing, I’d probably take fewer photos. So, the whole cycle begins with supreme ease of snagging digital images, which is in turn amplified by the attractiive venues for sharing them. Which leads me to want to have a method for taking them. Since using my camphone is reasonably high-risk, using my regular digital camera is slightly less so, we’re back again to wanting a cheap camera to have at the ready. The problem is that this is also making me realize why I don’t really like cheap stuff. It too easily becomes disposable. And as Annie Leonard articulated all too well, disposable has real costs. So I find myself fantasizing about an impact-resistant camera (or phone), kinda like those Panasonic Toughbooks. Maybe there out there already. But then again, so is another pencam. Cripes, maybe I should just start numbering ‘em like Pete Townshend. Or, I guess I could be a bit more careful next time. I know there’s more, but these are to get ya started… The next one is in 2011, so get riding! I guess it didn’t take too kindly to the last bounce off the pavement. 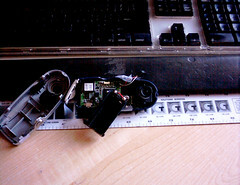 (Innards photo was from the exploratory surgery, not the fall itself…). 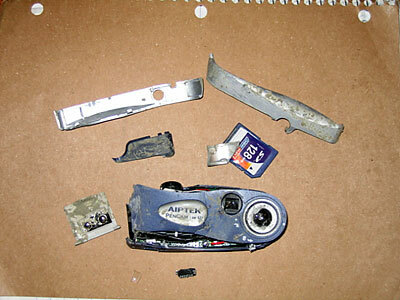 It lasted about a year, and something in the shutter/switching seems to have gone piffle. It will turn on, won’t react to the shutter (or the microswitch) being pressed, and then will not turn itself off. I was worried after I had to snap it back together during the Marin Century. Since I’ve got a couple SD cards, I’ve already ordered a replacement with no memory installed. - The all-singing, all-dancing Rivendell website means that they can post new product photos pretty seamlessly, so the result may be that the Cyclofiend RBW page will have less photos like that. It will continue to be where things Rivendell get aggregated (in addition to the RBW Owners Bunch on Googlegroups), and I’ll try to find photos, links and other Riv-in-the-news type stuff. If you see something like that, send it my way, eh? - On the other hand, I haven’t been riding much on the trails. Rolling downhill on new fireroads and singletracky bits is not an equivilent. Gotta get them knibblies slapped onto the Quickbeam. Anyway, that’s sorta it right now. Other longer missives to follow. After meeting a bunch of iBob’s at the NAHBS a couple weeks back, I got a chance to meet up again with Chris Beatie (who sent in photos of his 650B Wanta to the Current Classics Gallery) for one of my favorite southern Marin loops - up Conzelman Road to Hawk Hill, followed by the steep descent to Cronkhite Beach. Much of the summer finds this part of the SF Bay Area hemmed in by fog, but spring (and fall) often mean clear days. This was one of the latter, and we had a good time roaming around the old gun emplacements and enjoying the day. Photos here. Also in the “Demise of Things” file is the decision announced this past weekend of Rivendell ending its involvement with the RBW list over on bikelist.org. According to the email by john@rivbike.com, the folks over in Walnut Creek have decided to “bow out” of their involvement with the list. While I find this to be a shame, it’s also understandable. There have been a number of prickly comments recently, some clearly designed just to twist people’s lugs. Now, the months of February and March are typically the worst on many online communities, particularly when normally active people are staring at another day of snow, or thawing snow and mud, and wondering why the heck they ever bothered to buy a bike in the first place. Even the best of online friends get a little testy. But, some of the recent posts which floated down the RBW List flume seemed rotten at the core. Folks hiding behind what appear to be fictitious names, going off on really odd tangents in fractured language, hammering on subjects which had no place on the list. Then people reacting to those initial posts with civility tumbling like a falling house of cards. It also seemed as though folks began to look at the list as the means to communicate with Rivendell, rather than a discussion about Rivendell. Confusion in the customer service chain is a bad thing. I reckon those were the events which became too much load to tote, and the folks at Rivendell decided to pull the pin and let the cars roll back down the hill. 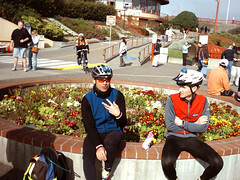 Speaking of rides, after a nice little loop on Saturday, JimG and I met up on Sunday to see if we could cheer on Carlos as he finished up the SF Randonneur’s 400km brevet. We thought we’d be able to head up towards Nicasio and pick them up there, as he was estimating a 24 hour finish time. As all plans with variables tend to go, this one changed appreciably. First off, Tashi got a bit wobbly as I was setting up to leave, so I ended up trailing her around the house until she steadied up and fell back asleep. After hitting the road, I called JimG, who was also getting a slightly delayed start. 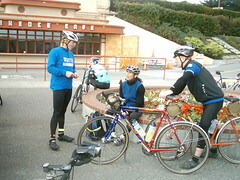 When we met up in Mill Valley a bit before 9 am, he said, “You’re not going to believe this, but Carlos and a bunch of rando-riders just went past!” So, after a quick debate, we headed off after them, arriving to find Carlos, Rob Hawks and bunch of other successfully finished riders hanging out by the Strauss statue. He seemed tired, but in great spirits and fine shape after riding 400km in 21:30! Huge congrats on a great ride! JimG got some good photos and Carlos already has his ride report and photos posted. We hung out and chatted with other brevet folks for a bit, then a very familiar-looking pair of Rivendells rolled past us in the parking lot - turned out to be none other than Rich Lesnick from Rivendell and Ron Lau, who has sent some beautifully set up bicycle photos into the Galleries. A nice chance meeting! When Carlos picked up and began his ride (ride!) home, JimG and I headed out on our planned “find Carlos” route, looping up through Marin, climbing White’s Hill and coming back via Nicasio and Lucas Valley. Despite his statements to the contrary, riding the 300k-from-hell seems to have pushed JimG’s fitness up a noticable notch, as he scooted up the climbs with frightening speed. I plodded along thinking about gear ratios. 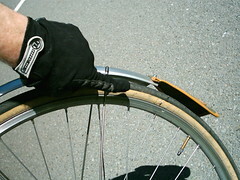 Not a good idea, exactly, while riding a fixed-gear, but it did pass the time a bit. As we reached the civilization end of Lucas Valley Road, I began hearing an odd “tick-tick-tick”. We pulled over and found that my rear tire had picked up a nail piercing the sidewall and the tread. Curiously, it still held air, so we skedaddled homeward and got within a couple blocks of our destination before it gave up the ghost. so you can slog your way back to the first problem. yourself right back where you started with no results to show for it. Which is kinda where I found myself on Friday. slightly tiresome to go through the Google upload just to end up with wobbly, swelling, spastic images from a too-flexy mount. Time to put everything up onto the project shelf for a few days and end my increasing frustration. So, this was the idea. The still photos are here. The videos are on the aggregated video page. 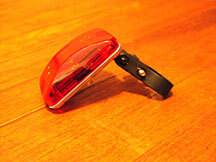 composite material of the blinkie-mount allowed the vibration. out, but the tick-tick-tick of approaching fall is now audible. The blinkie! 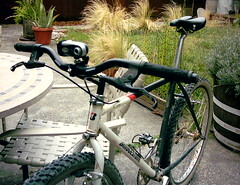 It has a seatpost mount band! 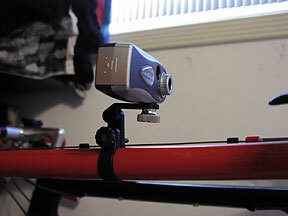 I also had a little mini-tripod that had a removeable camera mount screw, so I just used that. And hot-diggity! The band slid under the cable on the top tube and I think it’s mounted far enough forward to miss my knees. against one another, then clamp everything down. 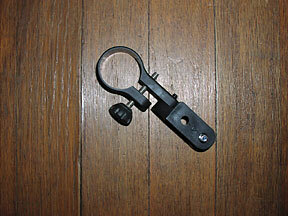 I also plan on using a thin hook & loop cable tie as a safety strap. probably work) or there will be a lot of sky in the footage. snippets of Graham Maby’s bass work from the first two albums. for the excercise of transfer than anything else. Here’s a real movie you should watch. It’s got bikes in it. Still no quick xfer method for getting from AVI to Mac, but tonight I eliminated several variables. From the Aiptek, via Google Video. Some of the “how-to” saga here. fried/crushed/soaked solution to taking photos on rides. camera for the $19/refurbished price). actions. Probably won’t be using mine. 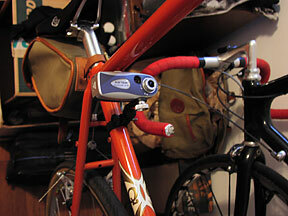 “photo” batteries in the pack for longer rides. notches into the “normal” setting and the “close” setting.